In 2017, when the team first sat down to brainstorm names and an identity for what was going to be a one-off brew, they could have only dreamed of the success in store for Whimsy and the subsequent series it would spawn. Our original design sprung from the mind of our previous Marketing Manager, Kyle Killam, and featured a vibrant blue background with a bright and lively orange slice pattern neatly designed in two rows of three. Throughout the past two years, Whimsy has morphed into our experimental outlet in the realm of NEIPAs. That first Whimsy featured Jarrylo, Amarillo, and a small amount of Citra. These hops, paired with a complementary malt bill, completely encompassed all of the senses with a joyous, out of this world citrus flavor. From there, our team of brewers have both tinkered with, and sometimes completely changed, the hop expression as they saw fit, giving them the freedom to design innovative NEIPAs with no-strings-attached along the way. That’s kind of our ethos here. We want to make great beers for everyone to enjoy while having a great time doing so; and for us that means experimentation with everything we do. After the OG Whimsy (as we informally refer to it as at the brewery) we released Summer Whimsy, Autumn Whimsy, and the most recent, Single Hopped Citra Whimsy. Before we proceed - I should explicitly mention that as this brand evolves, so too will the experimentation. The Whimsy series will still feature the creamy mouthfeel, restrained bitterness, and robust, juicy citrus flavors and aroma that you expect at no cost to the whimsical nature of the ever-changing hop additions. This update will simply give this New England India Pale Ale some vibrant new threads to match. As the brand continues to be one of the most beloved in our taproom and across liquor store shelves, we realized it needed an equally dynamic label that could seamlessly transform while still maintaining its identity throughout variations. 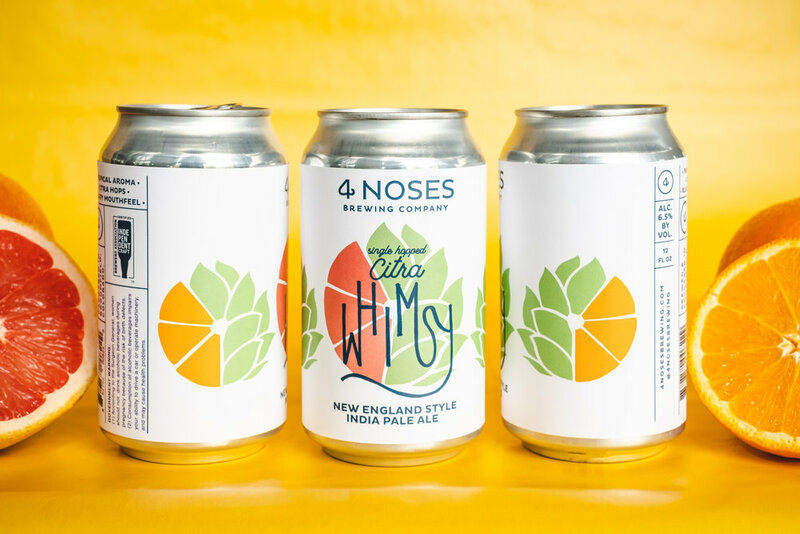 Starting March 25th, 2019, we will begin statewide distribution of the new Whimsy design, featuring the artwork of one of our 4 Noses, David Bibliowicz, with a re-release of Single Hopped Citra Whimsy. Single Hopped Citra Whimsy is a New England Style India Pale Ale featuring 100% Citra hops. What are your thoughts on the new can design? Any interesting hop combinations you’ve been hoping to see with this series? Let us know in the comments below or by dropping us a line here.